Our friend brought a new liqueur into our lives this year from her recent visit to Mexico. It is a Mayan honey and anise liqueur called Xtabentun. We immediately began researching cocktail ideas and found a pretty delicious one in the Mayan Margarita. We made a few tweaks and think this version is perfectly sweet, strong, and sour. Add all ingredients to a shaker over ice, shake until chilled, pour over ice in a rocks glass. Spritz has remained a favorite for summertime cocktails and bubbly aperitifs. This one is simple enough: Campari, white wine, and soda. But the complexity of the liqueur with the sparkle of the soda water gives it a big character. We found a lovely little Campari alternative at our local Total Wine last time around. Leopold Bros Aperitivo. A little more bitter, with a heavier citrus note. Great in this cocktail, and adds a different kick to your standard Negroni. Build ingredients in a wine glass over ice. Garnish with a lemon slice. Combine Zwack, vermouth, and curacao in a cocktail shaker filled with ice. Stir well until well-chilled. Strain into a martini or coupe glass. Garnish with optional orange twist. When I think Monaco, I think glitz, glamor, caviar, and champagne. And of course Daniel Ricciardo flying face first into the Red Bull pool after pulling off a redemptive win on the streets of Monte Carlo. Any excuse to have a cheese plate, some fancy nibbles, and a tasting menu of champagne is a good one for me. I found some cheeses from Italy and France to honor Monaco's neighbors and served up some caviar with melba toast, whipped cream cheese, and crunchy radishes. Caviar can be served on its own or with whipped cream cheese, butter, or even creme fraiche. Suggested additions range from sliced radishes to smoked salmon or hard cooked egg. If serving with radishes, a trick to get them extra crunchy is to slice and let rest in ice cold water for 15 or so minutes. Serve caviar in a bowl of crushed ice to keep it chilled. Serve with a non-metal spoon, traditionally mother of pearl, to prevent metallic taste transfer. Champagne cocktails are some of the easiest and most elegant cocktails. Everyone feels special drinking from a champagne flute, and with just a little creativity things can be made even more delicious. Add sugar to the base of a champagne flute, shake 2-3 dashes of bitters to saturate the sugar. Add cognac and swirl. Top with champagne or sparkling wine. Garnish with a twist. Add creme de cassis to champagne flute, top with champagne or sparkling wine. Garnish with raspberries or lemon twist (optional). Add St. Germain and lemon juice to champange flute. Swirl to combine. Top with champagne or sparkling wine. Add campari and vermouth to champagne flute or rocks glass, swirl to combine. Top with champagne or sparkling wine. Vermouth seems to instead be a stand alone day drinkers friend, perfect for sipping alongside some tapas and a group of friends. In fact one of my favorite articles is entitled How to Day Drink Like a Spaniard in Saveur magazine, all about Vermouth drinking culture. I have a super simple vermouth cocktail recipe up on the blog, if you want to experiment! For today's addition, we went for the other favorite: Gin. 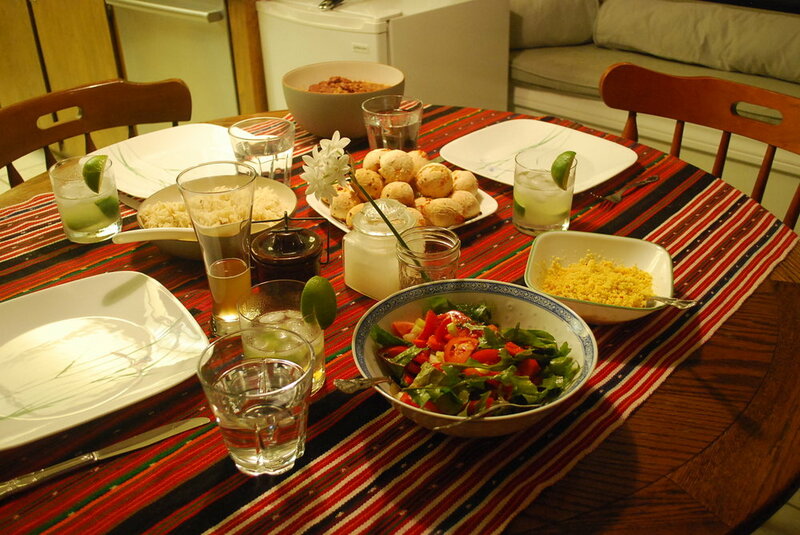 This recipe is adapted to what we could find in the States. The original recipe calls for Sauco which appears to be a liqueur made from the elderberry. However, we could not find anything resembling that here. So we went for elderflower liqueur, in this case St. Germaine, with lovely results. In a cocktail mixer over ice combine gin and elderflower liqueur, stir to combine until well chilled. Pour into coupe glass, top with cava. As soon as I opened the fresh bag of Sichuan peppercorns I knew we needed to create a cocktail to put them in. They were tart, spicy, floral, and something completely unknown. With the help of Serious Eats we found a great way to bring Sichuan peppercorn into cocktails. See below for a recipe for Sichuan Peppercorn Simple Syrup. Looking elsewhere on the web for inspiration, I loved this description of Sichuan (also spelled Szechuan) peppercorns from Addition, a company focused on bringing savory to cocktails everywhere. "The reality-warping Szechuan Pepper brings amazing floral and citrus notes along with heat that’s different from other peppers and chilies; Szechuan peppers will play tricks on your mouth with the tactile, prickly sensations they impart. " How fun does that sound! Pour all ingredients except egg white in a cocktail shaker over ice, shake until well blended and cold. If using, add egg white and shake again until blended. Pour over a single large ice cube and garnish with lemon peel and peppercorn (garnish optional). Because one of us enjoys whiskey and the other gin, we experimented with both and to our pleasant surprise they both work equally well. I love how the gin showed the slightly pink nature of the peppercorn simple syrup! Chef Jonathan Zaragoza suggests making a simple syrup with a TON of peppercorns to make sure you get a strong enough flavor-to-sweet ratio, I think it worked well. In a medium pot you take one cup of water, one cup of sugar, and 1/3 cup of peppercorns, bring them up to a slight boil, take it off the heat, and let it sit. Then do that again two more times, adding an additional 1/3 cup of peppercorns each time. At the end you get an intense syrup. I am inspired by the tapas and aperitif culture of Spain for a few primary reasons: culturally acceptable day drinking, abundant bite sized deliciousness, and the social gatherings that seem so full of laughter and love. Granted, I am basing this mostly on episodes of Anthony Bourdain: No Reservations and other TV depictions, so I am likely over-simplifying things. But, I stand by my adoration of gathering friends, eating lovely things, and drinking fortified wines. Both sherry and vermouth are new discoveries to me (one of the many reasons this blog is the best hobby ever!) These drinks turn out to be positively lovely! Catalonians seem to have a particular penchant for vermouth, and sherry is more imbibed in Southwest Spain in the so-called sherry-triangle where the grapes are mostly grown. Are you a geek like me and want to know more? The Spruce has a fun article on discovering fortified wine, which I highly recommend if you are a novice like me. If you just want to know the basics... try serving sherry chilled as an aperitif or digestif (before or after dinner drinks, respectively) and try vermouth the same or in the simple cocktail recipe below. In a collins glass, or whatever glass you have lying around, add a large ice cube. Top with vermouth, splash of soda water, and an orange slice. Perfect for an aperitif before dinner, with tapas in the afternoon, or as an after dinner drink to wind down the evening. Lightly muddle the mint leaves in a highball glass, then pour in the liquid, add ice, and stir. Garnish with the mint sprig, and as the author says "sip and smile". Alternate directions: if you don't have simple syrup on hand and don't want to take the time to make it, you can muddle 1 1/2 tsp sugar with the mint leaves and add the liquid ingredients on top, stir well, then add ice. Garnish and enjoy! This is one of my all time favorite cocktails. I know, I know, you can't just come out and make a claim like that. But honestly, this drink is so delicious I want to shout off roof tops about it. Apparently the Singapore Sling is a hotly debated cocktail with a hundred origin stories and no agreement on what the original recipe is nor what the best modern version is. The only agreement seems to be that it is to this day the "house" drink at the Raffles Hotel in Singapore, and that the version they serve there is sickenly sweet and undrinkable. Even so, I have to thank them for popularizing it, and thank mixologists over the decades for making it properly delicious. Adapted from a picture I took of a recipe from my brother! Combine the gin, Cherry Heering, Cointreau, Benedictine, pineapple and lime juices, and bitters in a cocktail shake and shake well. (Hold on tight, the pineapple juice foams and you don't want it flying everywhere!) Strain into a highball glass and garnish with orange slice and cherry. Another version from Serious Eats, sounds intriguing it has no pineapple juice and adds a splash of sparkling water. Maybe I'll try that the next time around. Or maybe I'll just stick with this recipe because as I started off by saying... Best Cocktail Ever. If you want to know more about the multitudinous "historical origins" of this lovely cocktail check out this article on The Spruce. Spritz: Italy's Most Iconic Aperitivo Cocktail, with Recipes by Talia Baiocchi & Leslie Pariseau is a beautifully illustrated and charmingly written cocktail guide and history of a particular genre of cocktail. First: A Spritz is always effervescent. Whether its bubble is aquired though soda water, prosecco, some other sparkling wine, or a flavored soda, the spitz would not be a spritz without bouyancy. Second: A spritz is low alcohol, which, for our purposes means that is should contatin no more that one ounce of strong spirits (perferably less). This is a drink that is consuemd when the day is waning and the night is young. Pour the Campari and vermouth into a Collins glass over ice. Top with soda water and add garnich (optional). Note: on this one we chilled the ingredients by stirring them in a cocktail shaker before topping with prosseco to make a nice cold drink for a particularly hot day. I have lived in wine country all my life. There are photos of me at five years old drinking from the wine press as we prepared to barrel our homemade wine. I appreciate good wine, red wine, white wine, cheap wine, sparkling wine, and of course a nice wine cocktail. I am not generally hard to please, but I also know something good when I have it. 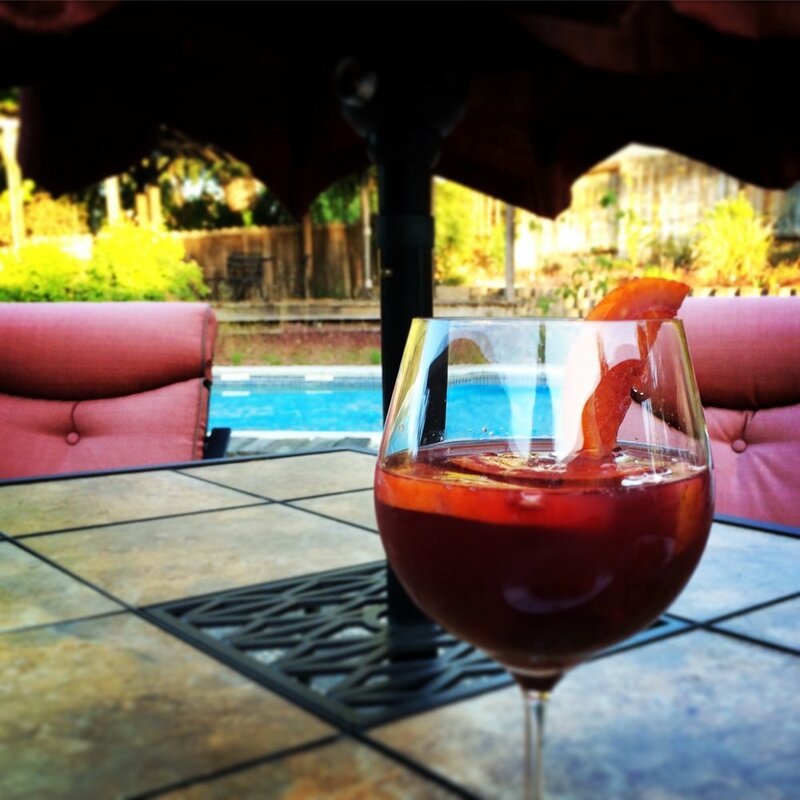 This is my favorite go-to Sangria recipe because it is simple, quick, and it still tastes like the base wine and the tangy fruit it is composed of. As perfect for a summer day as it is for a drink along with light Spanish tapas, or heavy Spanish stews. Just try it already! My family has a love affair with margaritas. We joked for years that when my brother-in-law had kids he would name them Jose and Margarita. It also just so happens that we love Mexican food, especially all forms of tacos. Growing up in California gave us plenty of opportunities to sample the best of what Mexican-American establishments have to offer, and although thier food can be outstanding, their margaritas are pure crap. Too Americanized to the sugary-sweet palate of most of their customers, they are undrinkable. We are here to remedy that, with this gorgeousness. It only takes one to feel like you could dance salsa with the best of them, and eat all those tacos at the taco bar, so be careful! Stir all ingredients together, serve over ice in a salt rimmed glass. My mother and my mother-in-law both broke down in giggle-fits at my engagement party. My friend fell asleep face down on a pool floaty ALL night at a summer party. A man lit fire to a palm tree in a back yard and failed to notice until someone sprayed him and the tree down with a hose -- which he found quite rude. And many other ridiculous and amazing travesties.